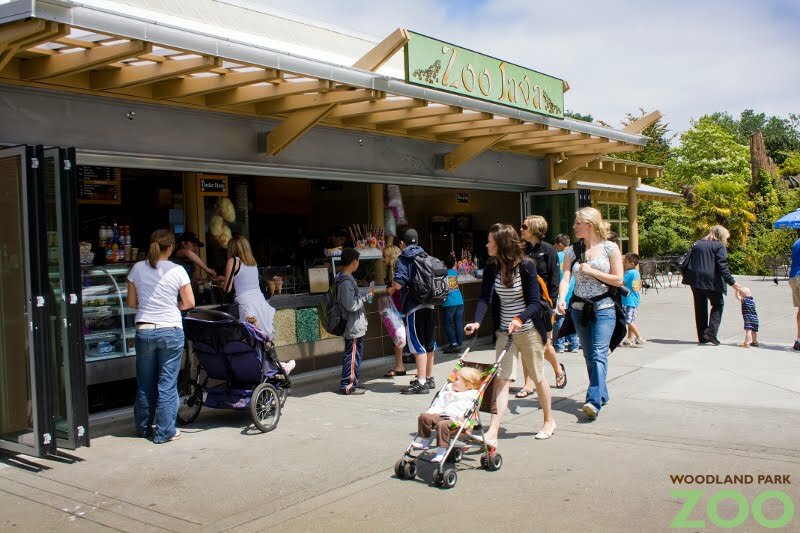 His ultimate vision is to construct a semi-closed system aquaponic operation behind the zoo’s Rain Forest Food Pavilion, raising trout and cycling the waste to grow herbs and salad greens. The herbs would be used in Lancer Catering’s food service operations; the trout as treats for the zoo’s penguins. And no packaging or shipping would be needed to get the food to market. Far fetched? 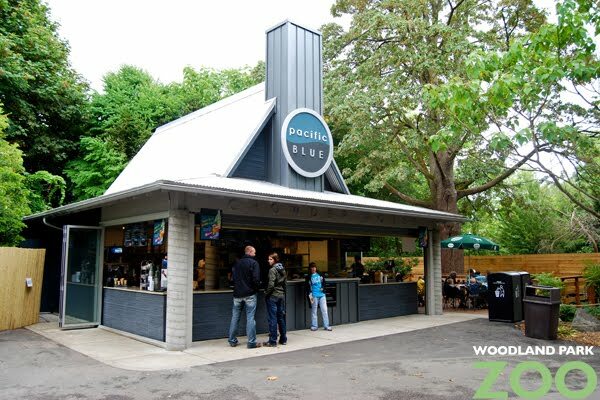 I talked to executive chef Brandon Bretz and general manager Maureen Gulley of Lancer Catering, Woodland Park Zoo’s food concession partner, about how they help the zoo source food locally to minimize their carbon footprint. While aquaponics is an amazing vision worth exploring for the future, what Lancer does right now is remarkable in its own right. Fish served at the zoo’s Pacific Blue Chowder House is sourced locally from Ballard Seafood using updated guidelines from Seafood Watch. Produce is also brought in from local growers via Charlie’s Produce. Bretz doesn’t just check with Charlie’s. He talks directly to the individual growers about their organic practices to make sure your mixed greens are truly “green.” Asparagus and mushrooms are also picked in-state, as is pretty much all produce Lancer offers except citrus. Milk and dairy products are sourced locally and bread is freshly baked nearby. Hotdogs are 100% beef. Hamburger comes from grass-fed, free-roaming cattle raised at small ranches that avoid using hormones. It all costs more, but Lancer has worked hard to maintain market pricing to make healthy meals affordable to families visiting the zoo. When purchasing local isn’t practical—coffee is a prime example—Lancer goes the extra mile to make sure it’s farm direct, shade grown, all organic and sustainable. 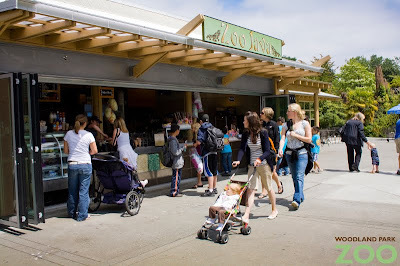 Caffé Vita coffee served at zoo espresso stands, including the new Zoo Java at the Rain Forest Food Pavilion, isn’t destroying the restaurant’s ecosystem namesake. 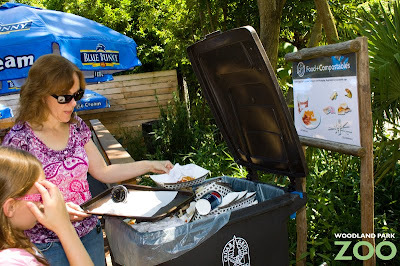 And at the end of the day, even the zoo’s waste isn’t wasted. 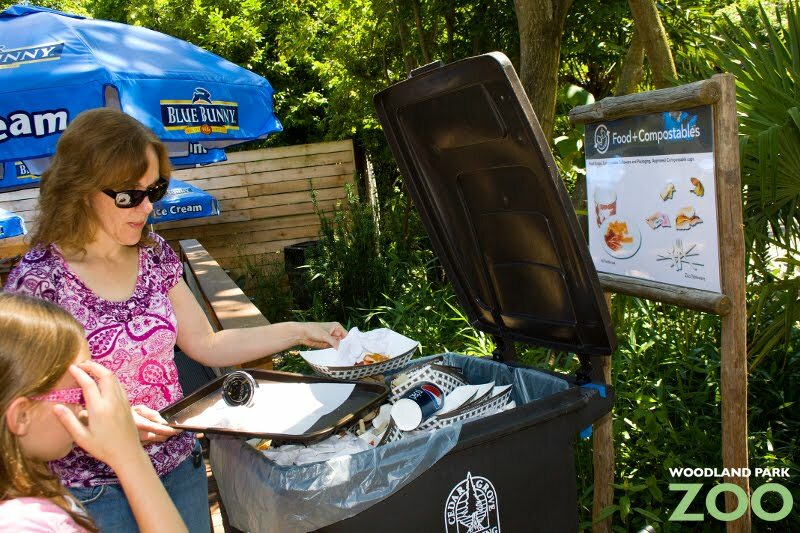 For example, the zoo’s Pacific Blue Chowder House waste is 100% compostable by offering innovative food service products like “Tater Ware.” And those coffee grounds from Caffé Vita? They’re mixed with other wastes to make Zoo Doo. It’s definitely worth raising your cuppa joe for a morning toast to sustainability. Photos: Penguin by Dennis Dow/Woodland Park Zoo, Pacific Blue Chowder House by Robyn Luk/Woodland Park Zoo, Zoo Java and composting by Rachel Gray/Woodland Park Zoo.